Copper is possibly the oldest metal known to man, predating the oldest historical records. It is quite abundant, with known reserves of 3 billion tons in 2003, which is nine times the total amount produced over human history. It is also the most consistently recycled of all common metals, in part because it is relatively durable. In 1941, it cost about $240 per ton, versus $320 per ton for aluminum and $19 a ton for scrap steel. Copper is readily smelted from its ores, which are widely distributed in the Earth’s crust. The United States produced most of its own copper requirements from mines in the western part of the country and had access to additional supplies from Chile (which produced about 500,000 tons a year.) Modest amounts were produced in the Philippines. Japan produced just under half of its own copper requirements from mines in the home islands, of which the most important were at Ashio, Besshi, and Hitachi. In late 1940 and early 1941, as war loomed in the Pacific, the United States and Japan maneuvered for control of the Chilean copper production, with the United States acting to preempt most Japanese purchases in February 1941. Once war broke out, Japan was deprived of its overseas suppliers and had to find ways to reduce copper consumption. 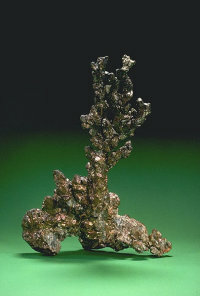 Most copper ore takes the form of porphyritic sulfide deposits. The ore is crushed and enriched through a flotation process, then roasted in air to burn off the sulfur. This produces copper oxide which is then smelted with coke or charcoal to produce the raw metal. This raw metal is usually hard, brittle, and unworkable due to the presence of impurities, including valuable metals such as silver and gold. These are removed by an electrolytic process, yielding the pure metal, which like pure iron is soft and ductile. Pure copper is an excellent electrical conductor and is used for wiring. For other applications, copper is alloyed with other metals. When zinc is the predominant alloying element, the product is known as brass. If tin is the predominant alloying element, the product is known as bronze. Both bronze and brass are harder and more resistant to corrosion than pure copper. Phosphorus can be added for even greater hardness and aluminum for greater tensile strength. Silicon could sometimes be substituted for tin in bronzes for less critical applications, as was sometimes U.S. practice. With suitable alloying, copper has the best tensile strength of any metal except steel and aluminum alloys. Copper was a limiting resource for both sides. The United States was actually in surplus in 1940, but demand skyrocketed thereafter and brass virtually disappeared from the civilian market. The United States stretched its supply of copper by releasing much of its monetary silver reserves for use as electrical wiring, and by replacing copper pennies with steel pennies. However, an attempt to develop steel cartridge cases to replace brass cartridge cases was unsuccessful. Though copper was the only metal Japan produced domestically in anything like the necessary quantities, the Japanese still found their supplies inadequate, and toward the end of the war were collecting household cookware and even melting down historical bronze temple bells to meet their requirements.